Find Better Ideas, Faster ® with a custom shower trend report, our PRO Dashboard and 80+ categories of premium trend reports. Trend Hunter’s Shower Trend Report examines today’s bathroom trends, focusing on showers, bathtubs and steam baths. As contemporary home decor trends continue to fluctuate, they create changes in bathroom designs. 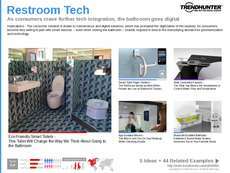 Our report investigates technology’s influence on shower trends, covering products like steam-resistant glass shower doors, hands-free mounted faucets and multifunctional shower heads. To close out the report, we look at innovative products that appeal to consumers from brands like Kohler, Oras, Moen, Puravida, American Standard and Triton Showers. Our research is ideal for interior designers, shower equipment manufacturers, retailers, tile makers and plumbing companies seeking greater knowledge into shower trends swaying consumer habits. The Shower Trend Report will be advantageous for companies looking to expand market presence via crowd-sourced data that highlights consumer preferences and appeal.